Annes Cottage in Keswick sleeps 4 people. Anne’s Cottage is a pleasant cottage, offering fully equipped and beautifully furnished holiday accommodation. 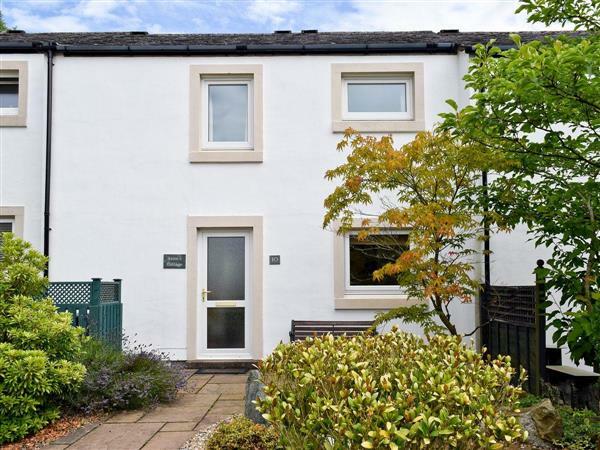 The location is perfect, situated on the banks of the River Greta, close to the leisure pool and five minutes level walk through Fitz Park to Keswick town centre. Ramblers will appreciate the numerous walks from the doorstep including the start of the Latrigg/Skiddaw walk which is only 400 yards away. It is in a semi-rural location, consequently there are an abundance of birdlife visiting the garden. The old railway line embankment nearby is now a popular walking and cycling track, following the River Greta and leading to Threlkeld. The shop, pub and restaurant are 200 yards from Annes Cottage in Keswick. Ground Floor: Living/dining room: With Freeview TV and DVD player. Kitchen: With electric oven with built in microwave, electric hob, dishwasher, fridge, freezer and dishwasher. Gas central heating, electricity, bed linen and towels included. Enclosed garden with sitting-out area and garden furniture. Bike store. Garage parking for 1 car, additional parking nearby. No smoking. Please note: The River Greta is adjacent to the enclosed garden. Holidays at Annes Cottage run from Saturday to Saturday. For a better idea of where Annes Cottage is, you can see Annes Cottage on the map below. Annes Cottage is in Cumbria; should you be on the lookout for a special offer, you can find all the special offers in Cumbria. It's always worth checking to see what is on offer at the moment. Do you want to holiday near Annes Cottage (UK1033), you can see other cottages within 25 miles of Annes Cottage; have a look to find your perfect holiday location.